It wasn’t that long ago that NVIDIA released the Shield (read our review of it NVIDIA Shield Review And Giveaway NVIDIA Shield Review And Giveaway Recently, we reviewed the Wikipad, which managed to make its way to market before NVIDIA's highly anticipated Shield. Ever since NVIDIA showcased the Shield at CES, I've found myself more and more fascinated by it. After... Read More ), a cool device with an attached screen that allowed you to play both Android and PC games. It had some drawbacks, namely being quite heavy and having a small display. To solve some of those problems, NVIDIA has released a full-size tablet version of the device – aptly named the NVIDIA Shield Tablet – and we’ve been playing around with one. To keep it game focused, the company has also released a standalone controller that looks a lot like the one attached to the original Shield. We’ve been messing with that as well, and now it’s time to get to the big question: is the Shield Tablet and its standalone controller worth picking up? That’s just what we are going to answer today. Best of all, we are giving away a $299 Shield tablet and a controller to one lucky reader! Keep reading this review to find out how you can enter the competition to take this device home for free. NVIDIA is a company on the forefront of graphics. Its GPU chipset for PC is always one of the most used, and the same is true in the mobile space, where its Tegra line consistently puts forth some of the best performance in a wide range of tablets and smartphones. 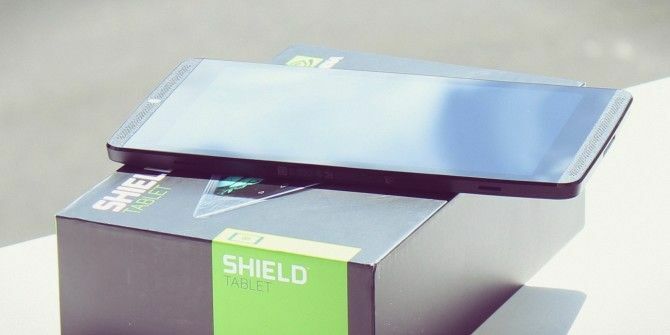 It only stands to reason that NVIDIA would want to use the power of its processors in order to make its own tablets, and that’s just what it did with the introduction of the Shield. Now, it’s taking everything a step further with the Shield Tablet, a device that brings the gaming focus of the first Shield to a traditional tablet, rather than a clamshell design. With that in mind, NVIDIA has also released a standalone controller, thus allowing gamers to achieve a more traditional gameplay experience. When NVIDIA calls this a gaming tablet, high-end specs are probably the first thing you think of, and as such, it’s competing with the absolute elite on the Android tablet market. The two that best compare with it are the Nexus 7 and the Samsung Galaxy Tab S — two beefy devices. Price wise, the Nexus 7 costs $229 (but it comes with a smaller screen compare to the Shield Tablet’s 8-inch), and the Samsung Galaxy Tab S costs $399. That puts NVIDIA’s extremely high-end tablet in a really good place with its $299 price tag, as spec for spec, it’s more powerful than both of its major competitors. Unlike the original Shield, it’s not just about gaming, as this eight-inch tablet comes packed with an almost stock version of Android, so it does everything you’d expect. It’s not as thin and light as some other’s on the market though, which could prove a hindrance to it being used as an everyday device. As you can see, this thing is a monster in the specs department, and it’s reflected in the benchmarks too. The Shield Tablet literally maxes out every benchmarking tool you could ever imagine. On MobileXPRT full benchmark tool, it scores a whopping 310, which is over 20 percent higher than the more expensive Samsung Galaxy Tab S. It’s really easy to be impressed with what NVIDIA has packed under the hood of this beast. Of course, it’s not just about numbers (though in this case, the numbers do carry some serious weights), as the tablet needs to feel nice in your hand, and look good. Does the Shield deliver on that, and even more importantly, does it deliver a quality gameplay experience with those specs? Let’s get down to the nitty gritty, which is the design of the tablet itself. In a world where the main selling point of a device is how thin and light it is, NVIDIA threw all of that out the window and went with a device that’s a tad heavier and thicker in order to pack it with as much power as possible. The Shield Tablet weighs a total of 13.7 oz, which is a full 3.7 oz heavier than the Samsung Tab S 8.4, and you can definitely feel that difference when holding the device. The depth difference is pretty substantial, with the Shield Tablet measuring 0.36 inches and Samsung’s offering coming in at only 0.26 inches. While .10 inches doesn’t sound like a lot, relative to the total size, it’s a large percentage. The Shield Tablet also has a larger than average bezel, but that seems to be done in service of giving you a little bit more to hold on to while playing games. Still, it goes further towards making the device larger than any of its competitors. If you are using the Shield Tablet primarily to play games, the size won’t be a big factor, but for portability, every little bit adds up. The speakers on this device are quite impressive, and most importantly, they are front-facing, which means you can actually hear the output while playing games, listening to music, and watching movies and TV. They offer solid sound, and there’s even dual bass ports that make things bump a little bit harder. From a pure aesthetics perspective, the Shield tablet is beautiful. It features a grippy plastic texture, with “Shield” written on the back in big beautiful letters. The screen is quite nice looking, but it does give off a pretty serious amount of glare, which is something to keep in mind if you’re going to be playing outside a lot. One drawback of the device is that it has no built-in stand. Playing games with a controller means you can’t hold the tablet, so you need to set it somewhere in an upright position. NVIDIA offers a cover that also doubles as a stand, but it’s another accessory you need to buy to really make use of the device. Unfortunately, it was completely backordered when we got the controller, so we were forced to review the Shield Tablet without it. All in all, this is a really well-designed piece of hardware. It’s a beautiful tablet and although it’s a little heavier than most modern devices, it makes up for it in power. It seems like every time I review something with a controller, I hate it, or at least have some serious problems with it. Whether it’s the GameStick GameStick Review and Giveaway GameStick Review and Giveaway We have the GameStick and its controller in our hands, and we've had some time to explore the games available, and of course, play them. Read More , and its revolting rectangular shape, or the OUYA OUYA Review And Giveaway OUYA Review And Giveaway When the OUYA was first announced and funded on Kickstarter, the Internet was positively buzzing over the possibilities for this tiny Android-based console. Kickstarter backers began receiving their consoles months ago, and early reports were... Read More and its controller that is just bad in every way; it seems like companies just can’t follow in the footsteps of the Xbox 360. Well NVIDIA did, because the Shield Wireless Controller is extremely similar to the Xbox 360, except the fact that it has parallel joysticks that are more in line with Sony’s design. You’ll find the standard array of buttons – four shoulder, four face, two joysticks, and a d-pad. Aside from that, you’ll find a tap-sensitive center, back and start button. On the very bottom of the controller is are plus and minus buttons, perfect for controlling volume without having to interrupt your gameplay. The best way to sum up the controller is just to call it great. The buttons feel nice, the joysticks have just the right amount of stiffness, and the d-pad is precise. It’s a little on the heavy side, much like the original Shield, but that also makes it feel solid and well-built. NVIDIA is a company that gets gaming, and it delivered an awesome controller with its knowledge of what gamers are looking for. At $60 for the controller, it’s priced right along with controllers for current generation game consoles, so it doesn’t feel like you’re spending too much on it. You’re not going to find a standard Android game that you can’t play well on the NVIDIA Shield Tablet. If you just want to use it as a touchscreen gaming device, it will do the job. And it will play everything you throw at it beautifully, but that’s not what really makes this device special. It’s the ability to play Android games without feeling like you’re playing a game built for a mobile device that makes this beast stand out. To start with, you can jump over to the Shield Hub and download all kinds of games specifically made to be played with a controller. Some are games you won’t expect to find like Valve’s incredibly popular Portal, and others that you’re used to seeing on traditional game consoles and PCs. Many of those games are good, and they alone make the device worth a look. Another awesome feature is the ability to map custom controls to Android games that traditionally only support touchscreen, thus allowing you to play them with the controller. The process is incredibly easy, and it allows you to play a whole slew of Android games in a way you never thought you could. And even better, some popular games are already in NVIDIA’s control mapping database, so once you boot them, it will automatically import optimal controls. To make it really simple, I will just say that this is the best tablet for playing Android games on the market. Whether touchscreen or with the controller, you aren’t going to find a better gameplay experience from a tablet. Yes, that includes those made by Apple as well. 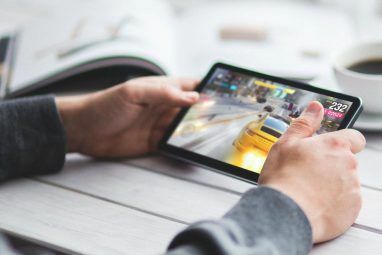 All Android tablets can run Android games, and many can do it with a controller, but what really makes the Shield Tablet stand out is the ability to stream PC games, both from your own PC over a local network, and from the new NVIDIA Grid streaming service. That, along with the monstrous specs, are the main reasons to purchase this one, provided of course that streaming service actually works well. A key thing to note about both of NVIDIA’s game streaming services is that a strong connection is required in order for them to work. When playing games over a network, latency is always something to be concerned about, and when the entirety of the game is streaming, you need solid a solid Internet connection to make it happen. If you don’t, you can still use the Shield Tablet to play games locally, but you’ll be missing out on the streaming features. So let’s start with local streaming, which we talked about in our original Shield review NVIDIA Shield Review And Giveaway NVIDIA Shield Review And Giveaway Recently, we reviewed the Wikipad, which managed to make its way to market before NVIDIA's highly anticipated Shield. Ever since NVIDIA showcased the Shield at CES, I've found myself more and more fascinated by it. After... Read More . Since then, the technology behind it has improved, and I actually found myself forgetting that I was streaming my games at all. While running Tomb Raider, I was thoroughly impressed with the visuals put forth on the Shield Tablet’s screen, and latency appeared to be a non-issue. However, when I moved up a floor in my home, thus getting further from my router, the connection dropped repeatedly, so it’s still not perfect. However, if you are close to your router, it’s a very solid experience, and one that rivals playing it right on the PC itself. There’s also NVIDIA Grid, a service akin to OnLive that allows you to stream your games from NVIDIA’s servers in San Jose, California, USA. I was testing the device from Connecticut, completely on the opposite side of the United States, and it still worked with only a bit of latency. For games like Street Fighter, it’s not optimal, as timing and precision are required, but for games like Saint’s Row 3 and The Witcher 2, it was not a terrible way to play. The service is still in beta, and it gives Shield owners free access to the games on offer, so it’s hard to complain about any latency issues, and it will be interesting to see how it works once it’s considered final. Both of these features give the Shield a huge edge on all other gaming tablets on the market. The ability to escape from the realm of what we consider “mobile games” to play the same things we play on PC is quite impressive. Of course, you are limited to playing in places where WiFi is available, so for some users this could end up being more of a novelty. However, for those who want to play their games without being tied to a PC, these features are both really fantastic. Whether playing Android or PC games, the console mode on the Shield is an awesome feature to have. It allows you to hook the device to the TV through an HDMI port and play games as you would a traditional game console. This means you could be playing your PC games from your home office on your living room TV using just the tablet and the Shield controller. You can set it to turn off its own screen, close all apps, and just function as a console in 1080p, or you can simply mirror whatever is on the screen. However you do it, the games look fantastic blown up on the big screen, and for users who don’t want to hook up a PC directly, this is a fantastic way to expand the games that can be played on the TV. The Shield Tablet is an extremely powerful Android tablet, and as such, it is able to run all of your entertainment apps with ease. Whether it’s watching Netflix or YouTube, you’ll have no problem with the Shield. There is one thing it does that other tablets don’t — it doesn’t involve consuming media, but rather, it involves broadcasting. Twitch streaming is integrated directly into the Shield Tablet, which allow gamers to broadcast their gameplay quickly and easily with just a few taps. You can also record locally, as you can see in the footage of us testing the tablet recorded in the video review above. All in all, there isn’t much to say about the Shield Table as an entertainment device. It does everything you’d expect from an Android tablet, though the extra weight does come into play, as it’s not as portable as other small tablets. It all comes back to the fact that this device is built for performance, and if you only want a tablet to watch movies on, you might want to look elsewhere. All in all, the $299 Shield Tablet is just a fantastic piece of hardware. NVIDIA has taken great strides to improve its game streaming technology, and that really makes this device quite a bit more usable than the original Shield. On top of that, NVIDIA has pushed the hardware to the absolute limit, packing an insane amount punch under the hood. Throw in the additional purchase of a controller, and you have a really solid gaming device. If you want a tablet to use for gaming, this is absolutely the one to buy. However, if gaming is secondary, and you want the thinnest and lightest device you can get, you might want to look elsewhere, as this one is aimed at performance first. How Do I Win The NVIDIA Shield Tablet? Explore more about: Android Tablet, MakeUseOf Giveaway, Mobile Gaming. When are you going to announce the Results? I currently have an iPhone and I find my self charging the device at least 2-3 times a day , does this phone have better battery life ? I never really got into the Nvidia shield so I'd like to know everything! Nice tablet, battery info would be nice though. Same question with the others. What is the battery life? is the responsiveness able to sustain over long hours of usage? really amazing specs...hope i will win this and MAKEUSEOF it! How's the battery when playing games and using peripherals? HOW LONG DOES THE BATTERY STAY CHARGED ? I'll just read the manual when it arrives. Thanks. Any word on the spirituality of this tablet? Hi! what about the battery life??? I'd like to know about the battery life. What are the best games now on the device? Also, how is the camera performance? I heard the build quality is not a total smooth ride, hairline cracks after some time. Is it true ? Is the windows version of the tablet available ? Does it run Flash and other web browser plugins?? Best review.......hope i would get it. How far do think technology will go? I'm with the battery life crowd. Love to know how it holds up. does it only have any additional games or only the android ones? Good review........i would like to share this. it was a great review, good luck everyone! Does pixel peeping too much for gaming affects the eyes? Since its built by nVidia, I'm guessing the quality of play is insane, what's the future of this tablet? As new games come out we have to do the revolving dance of more ram, bigger vid card to keep up, how long do you think this tablet would be a good for? Is the battery any good for intense gaming or it empties very quick? is this the only model? I did not know it came with a stylus. I would love to give this a try. It would certainly be an upgrade on my nexus 7. Is there a gap I need to worry about between the glass and the body!? Can you access your Steam game library from this device so you can play them? I have nothing to ask..everything is clear. Thanks. hamster can Play twister on it ? Is the controller as responsive as a console? will my kids be able to play minecraft on this device? Good review...would so like to try it! Also, (this is unrelated), what microphone are you using to record? Was the pen any use for you? I know all I need to know about this tablet, thanks Dave. How good is the battery? Does it last long with heavy games? Is this a perfect or near perfect gaming tablet or it has a lot of work to do? How's the battery life? It's a gaming tablet so it must have a long battery life. 6 hours of straight usage is enough for me. and does it heat up easily? Recently, I have read that a lot of devices heat up easily unlike other older devices that I used. Really cool device! Love it's look, the size, and the controller! Battery life, and can I play it on my iTunes movies through it on Plasma for a bigger movie screen? Of course, I'd like to know about battery life too - and if it's possible to charge the controller from the tablet part with a USB OTG. ETA on the LTE version? Looks like a great gadget! Seems like an awesome tablet, combined with features for T.V. monitor, has that been tested yet? How does the controller feel in long game sessions? What with battery life ? Is the screen good enough even when viewed slightly angled? What is the battery life and what ports does it have? Does the device heat up much after extended gaming sessions? How well does the tablet work as a media player? What version of Android OS is it using, and will it receive Android software updates such as Android L when released. How to run the games for maximum quality shield has? I want to know how long does the battery lasts, if it gets too hot in gaming, and how fluent is the UI. How long can this tablet run in normal (not gaming) mode, in other words what's with the battery life? Can I use it as a doorstop? likewise, I'd be interested in a copy-editing possibility. Does this tablet support external memory? Is it durable enough for a teenager? There's not much else I need to know, since I've already researched the guts out of this thing, except I live in Australia, so buying one has been an issue, since Nvidia doesn't sell it here. sounds not important as I'll use headphones for any listening. You heard it. We all asked it. What is the battery life? I'm sure in this day and age we could have power in a thin package. Or was NVIDIA trying to avoid the 'bends'? how strong shild is warmin in gamin? Though it is the common question it seems, yea what about the battery life? Thanks. Will be be getting Android upgrades in the future, especially Android L? How much the battery lasts? This was a great review, I would like to know about battery life as well. How's the visuals and resolution? For me, it's important to have a very clear and tidy interface. It looks really pretty. I want one. how long doesthe battery last when surfing the net? thank you! what;s the battery life on this tablet? Really great tablet for gaming... Would like to know about battery performance. Yes, battery life is important. How long does it last? Sounds like a great gamers tablet. I'm sorry if I missed it in the review, but does it have an SD card slot? I may have missed it, but does it have any sort of microSD card slot? How long will the battery last playing games from a full charge? What games would a seven year old like to play on this? Two questions: battery life would be nice to know about, and how tiring is it to hold it for a long time? Does the extra weight make it difficult after a while, or is it not a problem? Feeling hopeful to win this awesome tablet!! does it have a usb port? how do headphones link? Battery life & reliabiliy for sure.The shield itself is already a great product. I want to know the specs of a PC system this tablet is comparable to. I wonder how the Shield will compare to the new Nexus 9. Can I win this one please? I would like to know about the battery life and what ports (USB, mini HDMI and SD card) it has on it and on the controller. Cheers. Does it have long battery life? I just want a tablet badly. What else would I need for Netflix? Neophyte, here! What is the battery life like when using the tablet for gaming? Any unique case designs on the market to make this more playable? In which all the color comes this tablet? I'd love to win this for my wife. Yes I wonder how long a battery life does it have? do you think you would let a kid of nine use it?? I love to loan a tablet to the kids sometimes, to keep them busy for an hour or so. Wonder if this one is durable enough to let them use it at times! Does the tablet have a slim port or MHL and how is the OTG functionality? I'm not going to be original :) What's the battery life? And another thing, what about controller compatibility? Can I use normal X360 controller with shield? Can I use Shield controller with my PC? Like everyone else, I'd like to know about battery life and controllers. How many can I connect, and do they all need to be the same type, or could I do one Shield controller, one Xbox 360, one PS3/PS4, etc? I want to know about battery life,too. What's the battery life like? Can you expect a full day of heavy use out of it, or will you be running to the charger halfway through playing Portal on it? How does it compare to the Nexus 7 of last year? 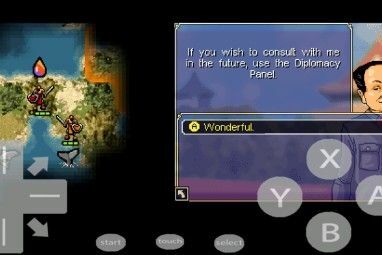 I've played some emulated games on my Galaxy Note phone and they run great, but without a physical controller, some of them are harder to play than they should be. I can only imagine how awesome it would be with this setup! This looks like a great tablet. I would mostly use it at home, so the size doesn't bother me. I want to use it as an extra screen for web references with my notebook and to contol my media center. Is there a way to unlock the bootloader to load a custom ROM? Quite interesting tablet ... worth getting [ or winning ;) ]. Nvidia a very well known name in graphics world combined with its own Arm Cortex CPU! What a brilliant combination! Should win over even the hardest critics. Can it use alternative app stores/sideload apps easily? Looks great. Can you root it and install CyanogenMod? Can I connect any usb controller to this tablet? Haven't seen the specs, but need to know if it has front and rear cameras, and what's the quality of each? Does it come loaded down with bloatware? What did you think of the sound quality? That's a top priority in any device I purchase. Was the sound clear and distinct? What is the Battery Backup of this Amazing tab while playing Games ?? I have no educated questions to ask, but I really want to win. Nvidia is a must have surely - they know their stuff right! How does the Stylus compare to the Galaxy Note stylus? Much as I would like one for myself (*still drooling*), what are the prospects for there being dedicated support in the future for conventional android development, e.g. - ART (runtime) or custom ROM support? Is this really feasible or is just another hot tablet with a 2 year shelf life? I am curious because I love to play around with the endless possibilities of having an android device. I am still rocking my first and only android - a 2 year old Huawei U8800Pro. Runs android 4.4.3 though. We all know that size matters , but in this case it seems to be a good thing. Nice to see it has a USB port, wish it was USB 3.0 though. I wonder if a future version will have one. I wish I had a question, but I've read so many reviews of it thus far that I could probably teach a course on the tablet. I just really really want one! How does the battery of the Shield tablet do? Sounds like a fair dinkum tablet, does it have a micro sd slot for extra storage ? I just started grad school and have been considering getting a tablet as my laptop has been getting quite slow as of late, do you think this tablet would be well suited for taking notes, viewing powerpoints, etc. ? How about the Battery? Thanks. I know I'm not the first to ask this, but what's the battery life like? Both in standard Android tablet mode (checking email, the occasional youtube vide, etc.) and while actively gaming? Seems like this would be a big deal for mobile gaming. What kind of play time on games and streaming video can you get on the battery? Do all of the features still work if you change the ROM to something more custom? I'd like to have the freedom to play around with Android a bit, but I'd definitely want to keep the gaming features. I'm surprised that the stylus actually looks useful. Did you try any business apps with it? What kind of play time on games and streaming video can you get on the battery. Dave, how durable is the NVIDIA SHIELD? Does it have an IP67 rating? Great review. One question, does it support USB OTG by default? Best Gaming Tablet Ever! Worth 300 dollars. Loving it. Want to win it!! Is it Really Worth 300 Balloons ? how about battery life ? is it truly strange device? I know it is designed for games, but it can do a multi-tasking so making it an all in one tablet? Any more details on the almost-stock Android build? And is the Shield in line for the "L" upgrade? I wonder how diligent Nvidia will be about upgrades. Can you recommend some good Nvidia exclusive titles? O yeah this is so awesome!!! Looks like this Tablet has everything, including expandable memory. My only question would be, will this tablet ever have native Steam support? I'm sure you could stream games through your PC, and I guess it's a question that should be directed at Valve rather than Nvidia, but I'm curious. Does this seem to heat up while playing it? I'm wondering about the battery life too. What would your internet connection need to be for best streaming results? is the stylus precise enough for artists? Does it heats too much to even have it in hands? Sounds perfect, doesn't seem like I need to know anything else. I would like to know a little bit more about battery life. No words. Just what doctor ordered? Perfect Product! Review is superb. Looking to win it. Awesome Nvidia! <3 Fallen in love! What’s the controller like ? Wonder what the actual battery life is like and whether you unit gets hot when you have been playing for a while. I wonder how battery life depends on what settings do I play - low or ultra high (if there are such)? Nothing . This review has everything i need . How many years will it update? What's the controller like, will it be comfortable to a PC gamer aswell and how does it compare to modern console controllers such as the PS4 and Xbox1? very nice tablet, thanks for the review. This tablet is probably the most overpowered tablet I've seen. Never seen a mobile device have 2.2 ghz before!! Great review and nice tablet. Does the stylus compare to the Note series one? Is it any good or do you have any uses for it on this kind of tablet? Does it have Micro SD options? Also, can you get me Half Life 2 with it??? What cases are available for this deceive? does it official cyanogenmod rom support? This looks like a *very* nice gaming tablet...the controller looks great, the headphone jack in the controller is a nice touch, the tablet looks sturdy (I bet it WON'T bend! ), and nVidia is the top name in graphics. The design is a somewhat bulky, ram is too little and the display is not HD 1080p. Will these features be improved in the next version? It is good for games, how about others? Whether it is convenient to play with a joystick on such a small screen? Any idea if the 32 GB LTE version will be online only, or will any stores carry it? Can you mirror everything to a big screen tv? Not just games. What cases are available for this deceive, from NVIDIA or others? I would like to ask about battery consumption. Can I use SHIELD to control my TV? Do you know by any chance, is there a Steam In home streaming solution coming to Android and the Shield tablet? I'd prefer that over Nvidias streaming solution. Were they correct in including a stylus for "THE ULTIMATE TABLET FOR GAMERS"? Perhaps a microSD slot would have been a better choice. it has a micro SD card slot but whats the max card size can it use? How good is the gaming on the tablet? Why is it called "Shield"? Does it have a card slot to expand? How long does the battery last, doing different things, e.g. playing games, watching videos, or ordinary tablet use. nice set up for gamers. Will this tablet satisfy all genre of people with work/entertainment wish for tablet? Any performance hit when streaming to Twitch? How long does the controller last? What about expandable memory? 16 GB seens to be a little less for a "gaming" tablet. Can we use the touchscreen as gamepad to control the PC games? How heavy is it, and how long between charges? I would like it, I like the tiny one very much! :) Thank you giveaway. From a full charge, how long does it take (while gaming intensely, like Portal or HL2) to fully deplete the battery? I, too, would like to know the power consumption on this device. Looks cool, what's the battery life? How long can you play, whats the battery life?